Visitors who want to enjoy great outdoor activities in Branson during autumn season, can experience it best at the Dogwood Canyon Nature Park. Located 16 miles south of Branson, this nature park is one of the most picturesque places to visit in Southwest Missouri. You will find Dogwood Canyon even more beautiful during autumn season as the foliage turns from lustrous green to vibrant reds, yellows and oranges. With the cool temperatures that you can feel around the park you can easily take advantage some of the most popular outdoor activities in Branson that you want to enjoy. This 10,000-acre nature park gives visitors easy access to a true wilderness experience to some great outdoor activities that include Hiking, Biking, Horseback Riding, Fishing, Segway Ride, Tram Tours, and more. This nature park features a relatively level 6 ½ miles of paved trail which is great for leisurely walking, hiking, and biking. The trail guides you past tumbling waterfalls, beautiful limestone bluffs, bridged formed of native stone or hand-crafted with wrought iron, and a covered bridge of Amish construction. You will also find rainbow trout swim in clear streams which are easily visible as you pass by. Horseback riding at Dogwood Canyon offers you a one-of-a-kind spectacular view of the majestic Ozark Mountains. With the exciting horseback riding activity at the park, you will be guided by a wrangler on an unforgettable 1 to 2 hours trail ride. Enjoy the fun of horseback riding to the tops of the ridges where you can experience some of the most breathtaking 360 degree views the Ozarks have to offer. From there, you make your way down the winding valleys and passing rolling pastures where you see buffalo and longhorn cattle. One of the park’s greatest appeals is fishing in the sparkling, spring-fed water that is home to rainbow trout. The park offers half-day guided catch and release fishing and two-day fly-fishing schools with the opportunity to keep or release. Another exciting activity that you can enjoy is a travel adventure with Segway through the park’s most breathtaking sites for a round trip tour to the Glory Hole, a magnificent blue-green pool where you’ll find the largest trout. Also offered at the park is the Wildlife Tram Tour which provides a fascinating journey into this special property for two hours. This tram tour traverses into the more rugged areas of the canyon and crosses to the Arkansas border. This tram tour is the number one attraction at Dogwood Canyon. While on the tram, you may have the chance to spot wild animals such as herds of bison and elk that still live on Dogwood Canyon grounds. Other herds that you will see on the grounds include Texas longhorn cattle and whitetail deer. 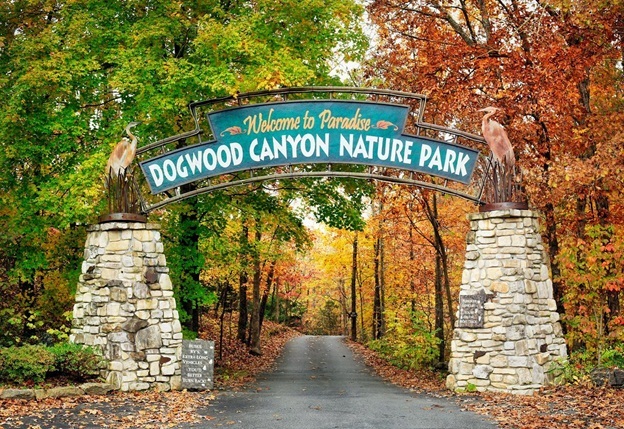 So, if you plan to enjoy with some of the great outdoor activities in Branson, your best bet is to visit Dogwood Canyon Nature Park where you’ll enjoy hiking, biking, horseback riding, self-guided trout fishing, Segway ride adventure, and wildlife tram tours.